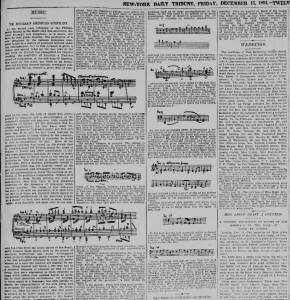 On December 15, 1893 Krehbiel wrote an extensive analysis and explanation of The New World Symphony in the daily publication of the New-York Tribune. In the article, he seems to capture words that Dvořák had said to him during their interview, noting that the melody of the second movement Largo is inspired by Henry Wadsworth Longfellow’s epic poem, The Song of Hiawatha. His article even mentions the work of Alice Fletcher, who worked on transcribing and notating Native American music in the later 1800’s. All in all, it’s amazing to see what sort of influences other people could have on Dvořák or the music he composed. Letters from an orchestral society allowed them to play piece of his that hadn’t been published yet. The request for writing notes by Krehbiel gave him an interview which eventually led to my knowledge of what inspired Dvořák for a small portion of his symphony. These letters set the stage for what we now know of Dvořák: a man who took melodies from truly American tradition, whether positive or negative, and insisted that they be used for the core of American music. For those interested, here is a link to Beckerman’s later article (written in 1992) published in Notes. It further explains the relationship between the Largo movement and The Song of Hiawatha as well as includes a republication of Krehbiel’s 1893 article! It further explores the relationship between Krehbiel and Dvořák as they were in correspondence during much of the time he spent composing and conducting the New World Symphony. 1 Michael Beckerman. “Dvořák, Antonín.” Grove Music Online. Oxford Music Online. Oxford University Press, accessed March 24, 2015, http://www.oxfordmusiconline.com/subscriber/article/grove/music/A2257504. 2 Beckerman, Michael Brim. 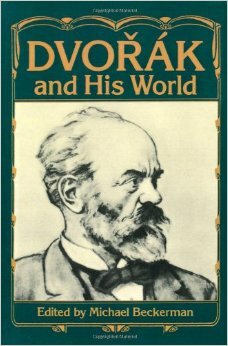 “Letter’s from Dvořák’s American Period: A Selection of Unpublished Correspondence Received by Dvořák in the United States.” Dvořák and His World. Princeton, NJ: Princeton UP, 1993. 199+. Print. This entry was posted in Stephen Sweeney and tagged Dvořák, Dvořák and His World, Grove, Krehbiel, New World Symphony, Song of Hiawatha by Stephen Sweeney. Bookmark the permalink. Wonderful, wonderful job. Keep it up!